display Archives - Touch Display Research, Inc. Yesterday, Apple announced its “best iPad ever” –the iPad Air, and the retina display iPad mini. The iPad Air is especially attractive, with 20% thinner than the iPad 3 (also called the new iPad when it was released in 2012), and 31% lighter than the iPad 3. Narrow bezel touch and display. Touch Display Research believes the iPad Air used the GF2 (Glass Film with double side transparent conductor) touch structure, compare with the GG (Glass Glass) structure used in the previous iPad. Change one pieces of 9.7” glass to film, Apple could save 0.5mm to 0.8mm in the thickness, and save 0.1 to 0.3 pound in weight. We also believe the display and touch screen in iPad Air have a narrow bezel than the previous iPad. This contributed to the light weight as well. This entry was posted in Displays and tagged display, film touch, GF2, iPad, iPad Air, light weight, narrow bezel, thin, Touch sensor on October 23, 2013 by jennycolegrove. On October 16th, Applied Materials announced new technology systems for manufacturing IGZO TFT: the AKT-PiVot® 55K DT PVD, Applied AKT-PiVot 25K DT PVD and Applied AKT 55KS PECVD systems. Applied Materials supply two sizes of IGZO manufacture equipment: One is for Gen 8.5, 2200mmX2500mm mother glass. One is for Gen 6, 1500mmX1850mm mother glass. Metal oxide TFT, especially IGZO TFT has been researched for many years. Sharp is the first company to mass produce IGZO TFT since 2012. Although Sharp first announced to produce IGZO TFT in April 2011, it took them one year longer than expected to bring it to mass production. LG started mass produce IGZO TFT for their 55” AMOLED TV since early 2013. I had a chance to meet Applied Materials team: Max, John, Kerry, Ricky, and Amaya recently in their Santa Clara office. I raised the questions of how to improve IGZO’s stability, uniformity and yield. Applied Materials indicated they have solutions for all three issues. Applied indicated they are working closely with four display companies currently. More analysis and IGZO display roadmap can be found in our Touch and Emerging Display monthly report. This entry was posted in Displays and tagged AMOLED, Applied, Applied Materials, display, equipment, Gen 6, Gen 8.5, IGZO, LG, manufacture, Metal Oxide, Sharp, TFT on October 16, 2013 by jennycolegrove. Today Microsoft announced the updated Surface tablet PCs: the Surface 2 and Surface Pro 2. This time both will use a display with the same resolution––1920X1080. 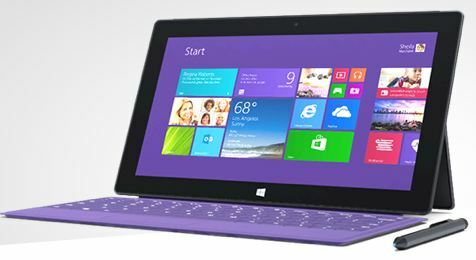 In October 2012 and February 2013, the first Microsoft-branded tablet PCs were released––the Surface RT and Surface Pro. After years of focusing on software, Microsoft now had a tablet product in addition to hardware lines such as the Xbox game console. In Microsoft’s July 2013 financial report, the company took a $900 million loss due to the Surface. Obviously, the first Surface tablet PC wasn’t very successful. As we wrote in the August issue of Touch and Emerging Display report, we believe one of the mistakes that Microsoft made was with the display. A 10.6” size and two different pixel formats for the RT and the Pro were used. 10.6” size was never mass-produced by any display manufacturer before Surface, therefore both of the 10.6” displays were custom made, and that meant a high cost. The result was the high price of the original Surface tablet. Nevertheless, the second round should be better. Microsoft used the same pixel format this time for both the Surface 2 and Pro 2. 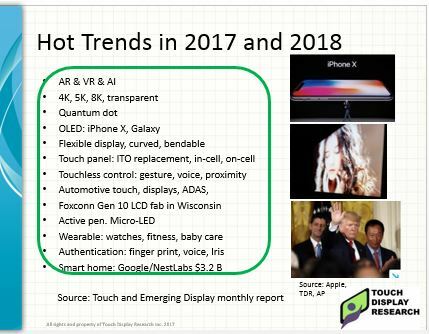 More analysis about the touch screen and active pen features can be found in our Touch and Emerging Display monthly report. This entry was posted in Company News, Displays and tagged active pen, display, Microsoft, Microsoft Surface 2, touchscreen on September 23, 2013 by jennycolegrove. “I am honored to be delivering a special forum at the conference, and eager to meet Taiwan’s touch screen manufacturers and emerging display manufacturers,” said Dr. Colegrove. Taiwan is one of the most active regions in touch screen manufacturing. In 2006-2007, Apple’s iPhone brought revolutionary changes to the touch screen industry. 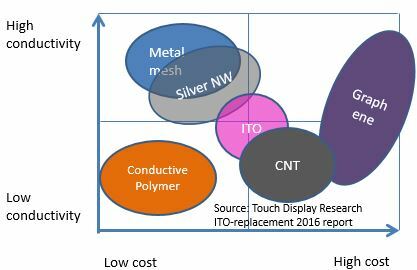 Touch panel companies at the forefront such as TPK, Wintek, Youngfast, J-Touch rode the wave and grew rapidly. Recently, display and touch screen integration have become necessary to reduce cost, weight, and thickness. This has led display manufacturers such as AUO, Innolux (used to be named ChiMei Innolux), and CPT to grasp an opportunity and supply the new devices. I am honored to be delivering a special forum at the conference and eager to meet Taiwan’s touch screen and display manufacturers. This entry was posted in Displays and tagged conference, display, flexible display, IDMC, Large display, large-screen television, LCD, LED lighting, OLED, Samsung, Taiwan, touchscreen on August 8, 2013 by jennycolegrove. Sony Corporation has lost money five years in a row. However, during both this May and August Sony announced good news: it swung back to a profit in its fiscal fourth quarter (FYQ4 ended on March 31st) and fiscal first quarter (FYQ1 ended on June 30th). The main contribution to this new profitability is “lifted by the first black ink in 3 years at its long-struggling TV business” as indicated by Wall Street Journal on August 1. As we covered in the monthly “Touch and Emerging display report”, Sony has released several 4K TVs. Sony has adopted QD Vision’s quantum dots on some of its TVs for better color and lower power consumption. 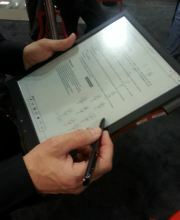 Sony is planning a flexible e-Paper display (from E Ink) tablet with pen-writing function by end of this year. Sony added more pen-writing notebook PCs. Recently Sony has unveiled SmartWatch 2 with a larger 1.6” 220×176 touch display (the original SmartWatch has a 1.3” 128X128 OLED display). Photo by: Touch Display Research Inc. 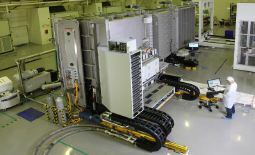 Although a profitable quarter is good news, the profit of FYQ1 is only 3.5 billion Yen, a 0.2% profit margin. It is still left to be seen if Sony can maintain profitability the entire fiscal year. This entry was posted in Displays and tagged AMOLED, display, e ink, eink, Electronic pen, Large display, OLED, sony, touchscreen on August 5, 2013 by jennycolegrove. Our mission is to provide accurate industry knowledge, up-to-date information, forward-thinking analysis and the best business strategy recommendations to our clients. But the young visitor didn’t hear me, and kept chatting with the LG booth people. I walked away with a bit of heartbreak and sympathy for the young visitor. I recently saw presentation slides from a university professor. In one slide he indicated IGZO TFT was still in R&D stage. I looked at the presentation time––March 2013. I know that Sharp announced the mass production of IGZO TFT in April 2011, and finally mass produced it in April 2012. I met Sharp’s CTO in April 2012. Obviously, that professor had out-dated information and hadn’t followed Sharp’s progress in IGZO. There are many people like that young visitor and the professor who only know part of the technology, part of the story, and unfortunately provide wrong opinions. They don’t know that AMOLED can have color filter too, they can’t tell Samsung from LG, they don’t know that Sharp has already mass-produced IGZO since 2012, but they are willing to spread wrong information. I’m concerned about these people and the people they advise. 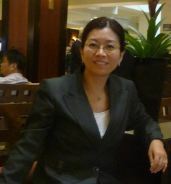 I feel as a Ph.D. and experienced technology analyst, I have the responsibility to provide to my clients correct knowledge, up-to-date information, forward-thinking analysis, and best business strategies. This entry was posted in Displays, Touch screens and tagged AMOLED, conference, display, IGZO, LCD, LG, OLED, Samsung, SID 2013, Touch screen, touchscreen on July 11, 2013 by jennycolegrove. I’m in beautiful Vancouver, BC this week to attend and give a speech at the SID 2013 Displayweek conference. 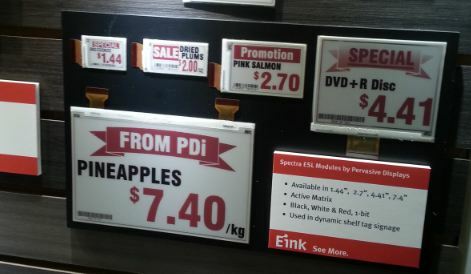 How does E Ink’s “Spectra” work, and how fast does it switch? When will E Ink’s flexible active matrix display be on the market? What’s the technology used in the 13.3” flexible active matrix display? 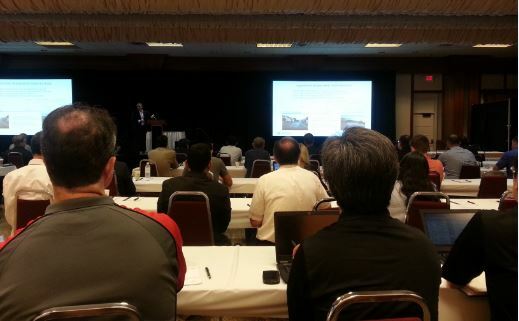 What’s the flexible active matrix display roadmap through 2015? 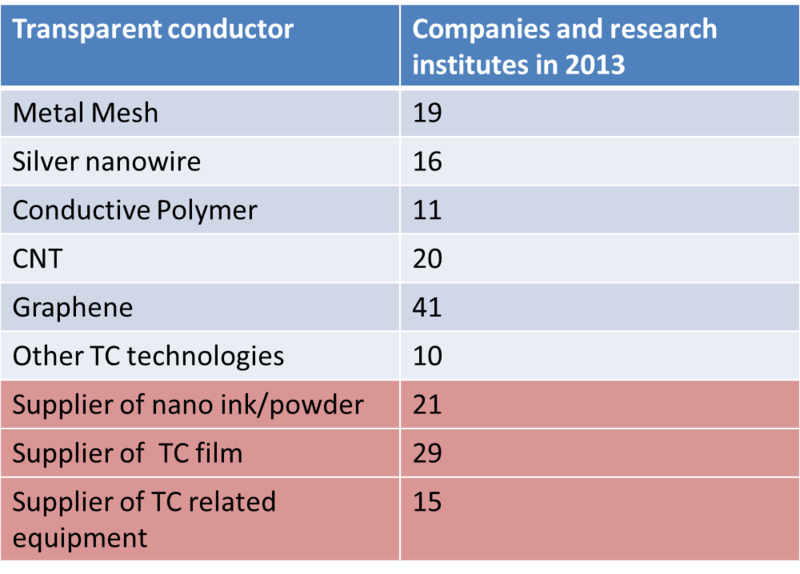 A detailed analysis will be in the upcoming “Touch and Emerging Display Monthly Report”, May 2013 issue. This entry was posted in Conference Review, Displays and tagged conference, display, e ink, eink, flexible display, Flextech, spectra, Touch screen, touchscreen on May 24, 2013 by jennycolegrove.